Of course, as someone who lives in Leiden, Den Haag is like a second city for me. It is like the city to go to whenever I want to hang out with friends, try out new coffee bars, study, buy some clothes, or shop for exotic Asian ingredients that are not available in Leiden. And as a normal person, I usually go to Den Haag by train, for it only takes 12 minutes. However, last weekend was very special for me, because I decided to go to Den Haag by bike. I was not the only crazy person in Leiden. Two other people joined my trip, fellow Indonesian students named Tobias and Alhadid. After a few days of making plans, we set up Leiden Centraal as our meeting point in a sunny Sunday. According to Google Maps, our route was to pass several towns such as Voorschoten and Wassenaar before finally reaching Den Haag. The end point of our bike trip was a famous Indonesian noodle restaurant named SeleraKu (‘My Taste’ in English) at Laan van Meerdervoort. Google Maps said that it would take about 58 minutes from Leiden Centraal to reach SeleraKu by bike, with the distance approximately 18 km. We finally took off from Leiden Centraal at 1 PM. We were not on tight schedule anyway, so we had agreed to take several breaks and to visit some forests worth visiting along the way to Den Haag. Our first detour was a lake called Valkenburgse Meer, not too far from Leiden. I think it was around 25 minutes by bike. It was shallow lake and since it was sunny, we saw some elders bringing their dogs outside and some parents with their children. We did not spend a lot of time on this lake because it was too ordinary and there was nothing special to see there, so after a short break, we decided to continue our journey. On the way, we passed a very beautiful forest with a house overlooking the highway and the bike lane we were biking on. Tobias asked if we wanted to do a detour and we said yes. It was a small forest with several houses, and according to the map, it was called De Pauw. We went inside, took a small break, I took out my homemade brownie as a light snack and all of us ate the brownie. I was really happy because the brownie was finished. After that, we decided to walk inside the forest and take some pictures, because it was a very nice weather and… who didn’t love forests in autumn? Alhadid and Tobias, the biking squad of the day. It seemed like other visitors of De Pauw had enjoyed their day inside the forest. We passed several elders with their dogs and a few people doing their afternoon jog. The air was crisp, the sun was shining brightly, and I felt so contented. Moreover, I experienced the feeling of stepping on a bed of fallen leaves so many times in this forest. Indeed, it was very pleasant! I loved the feeling when I step on the fallen leaves and when I heard the sound of the cracked leaves. I could also smelled the smell of autumn breeze. At that moment, I felt the time stopped, and I was taken to my own happy place that I thought had only existed in my small mind. After finished walking on the woods, we decided to continue the trip and to make De Pauw as our last stop. Hence, we cycled all the way from Voorschoten to Den Haag. It was a very smooth ride. We passed the outskirts of Wassenaar and we passed some lush forests on the way to Den Haag. Actually there was another forest that we could go to, but we already felt so hungry so we decided to skip the last forest we saw on the way there. I swore I could taste SeleraKu’s noodle on my taste bud, hahaha! Around 4 PM, we finally arrived at our end point. So it was not a 1-hour journey, because we took two stops. But we did not feel sorry for it. As what I have said before, we took this trip as a laid back trip, so we were not chasing time. And after a few hours of being hungry, finally I could eat the famous SeleraKu noodle at the end! It was a very pleasant journey and I could not wait to do that again. Perhaps to another city. Stay tuned for other stories of my biking trip! If you wanted to join, we would be so thrilled to have you in our team! 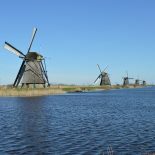 This entry was posted on November 10, 2015 by in Living in Holland and tagged Den Haag, leiden, travel, weekend.